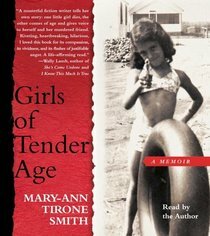 In Girls of Tender Age, Mary-Ann Tirone Smith seamlessly combines a memoir whose intimacy matches that of Angela's Ashes with the tale of a community plagued by a malevolent predator that holds the emotional and cultural resonance of The Lovely Bones. Smith's Hartford, Connecticut neighborhood is small-town America, a post-World War II housing project where everyone's door is unlocked and everything is within walking distance. Her family is peopled with memorable characters-her possibly psychic mother, her adoring father, and the numerous aunts and cousins who parade through her life with love and food and endless stories of the old days. And then there's her brother, Tyler, Mary-Ann's real-life Boo Radley. An autistic before anyone knew what that meant, Tyler was unable to bear noise of any kind. The sound of crying, laughing, phones ringing, or toilets flushing was such an assault, he would substitute that pain with another: he'd try to chew his arm off. Hanging over this chaotic, but joyous American childhood is the sinister shadow of an approaching serial killer. The menacing Bob Malm lurks throughout this family portrait, and when the paths of innocence and evil cross one early December evening in 1953, the havoc he unleashes forever alters the landscape of Smith's childhood.